Bring your pup in for a day of fun! No appointments necessary after completion of evaluation! 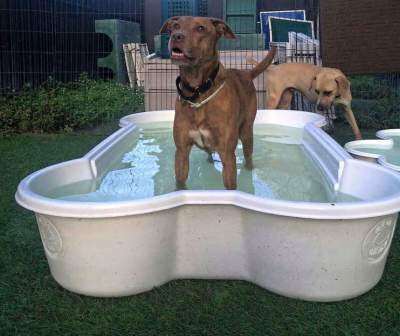 They'll get to splash in our doggie pools, play with toys and each other, and get lots of love from our sitters. Dogs are supervised 24/7 so they are never alone. Each dog will get their own report card sent home with them at the end of the day so you know how they did and who they played with. 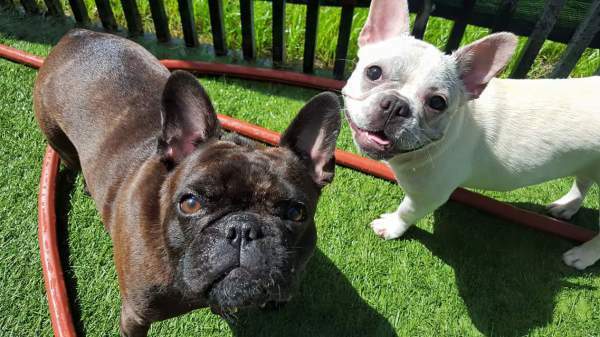 Daycare is entirely cage-free, with dogs only being seperated for feeding and short rest periods if needed. Bring in breakfast, lunch, and/or dinner for your dog and we'll feed it to them in their own personal feeding station. Drop off and pickup for half days or full days of daycare is available from 7am - 9pm everyday of the year. However, "Nap time" for the dogs is from 1pm-2pm and we ask that you avoid drop-off/pick up during that time so the pups get plenty of rest. They'll have different beds, blankets, and pillows to choose from and get to cuddle with sitters. ​Treat your pup to a day at the spa while they're here for daycare! Check out our Spa page for pricing. *20 day passes come with one free bath.